After several months using the stock mic that came with my truck’s CB radio, it suddenly went quiet. Upon inspection, I noticed that a section of the cable was broken. Since the CB worked just fine, I decided it was more cost effective to invest in the best CB power mic I could find. During my search, I came across some high-quality mics five of which I’ve reviewed here. But before that. Why do you need a quality CB mic? The mics that come with a CB radio pack may not do the right job. That’s why we may need to replace CB microphone. If the person at the other end is to clearly hear what you’re saying, the mic needs to capture the sound waves coming from your mouth. In the case of high-quality mics, they can even cancel out background noise ensuring you’re loud and clear. Where do you prefer to place your CB mic inside your vehicle? Whether it’s the dash or even hanging from the rearview mirror being able to reach it easily is quite convenient. Also, being able to speak through CB radio microphone while holding it with one hand allows you to keep your eyes on the road while driving. My CB’s factory installed mic stopped working after a few months. Many manufacturers don’t make an effort to upgrade the factory installed microphones that come with their radios. Many aftermarket CB mics are regularly updated to include better features. Most are also compatible with CBS from different manufacturers. 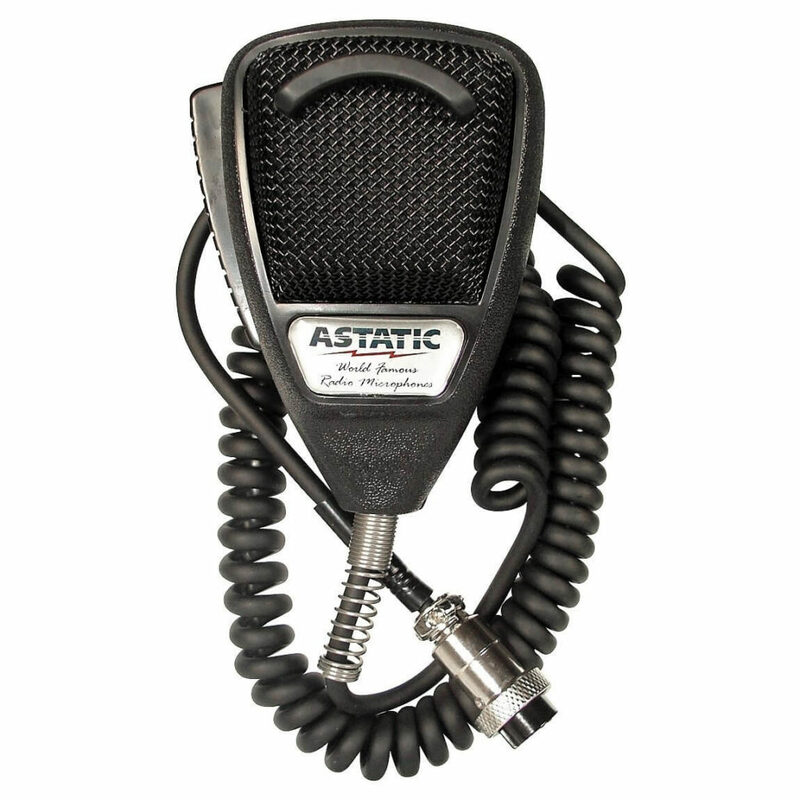 The Astatic CB Mic features a rugged and compact design that blends in well in most vehicles. For exceptional sound clarity, it comes with built-in noise canceling which filters out background noise. Also, it comes fitted with a low impedance dynamic element for better sound clarity. This makes it a good choice for radios with PA functionality. The attached coil cord with 4 pin connector is quite long. It’s also not as thick as cords you’ll find on many competing units. This makes it easy to handle the mic. Its front steel grille is polyurethane coated. You won’t have to worry about it rusting or breaking in case of an accidental fall. Buy one, use it, and you will have reasons to say ‘Amazing noise reduction!’ Also, it is good for CB, amateur radio, and SSB communications. The workman DM507-4 is a good option if you’re looking for an inexpensive but reliable microphone. It comes in a compact and lightweight design that’s easy to handle. The design features a large push to talk button that’s easy to press when you’re transmitting. One thing you’ll notice about this CB radio mic is the plastic body. At first glance, you might have the impression that its cheap plastic. I had this impression. However, upon handling the mic, I realized that the plastic is tough and you should expect it to withstand knocks without breaking. The mic is connected to an 8 foot coiled cord. At the other end is a 4 pin connector which attaches to a variety of CB radios from popular manufacturers like Cobra and Uniden. What you will love about this microphone is that they have taken care of user experience. 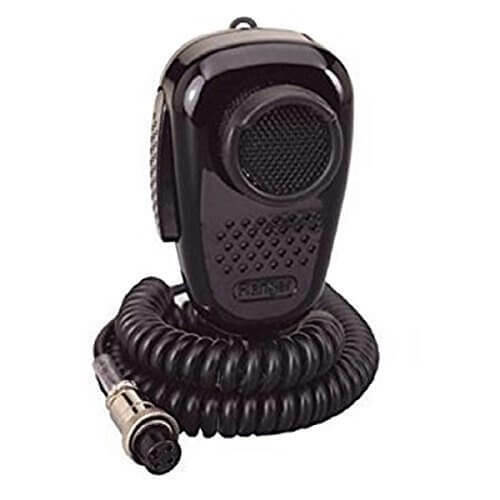 If you are looking for the best replacement CB radio microphones, then Cobra M73-70 will be a great choice. Cobra CB microphones are well known for their innovative designs. The HG M73 70 is no exception. The design features an ABS shell which is tough and durable. It also includes a metal mesh grill which not only adds to the mic’s strength but is also rust proof. A left side push to talk button makes it easy to transmit even if you’re driving. Connecting the mic to your CB is a 9 foot coiled cord with a 4 pin connector. This makes it compatible with many CB radios from cobra and other brands. It’s worth noting that this power microphone runs on batteries which aren’t provided with your order. 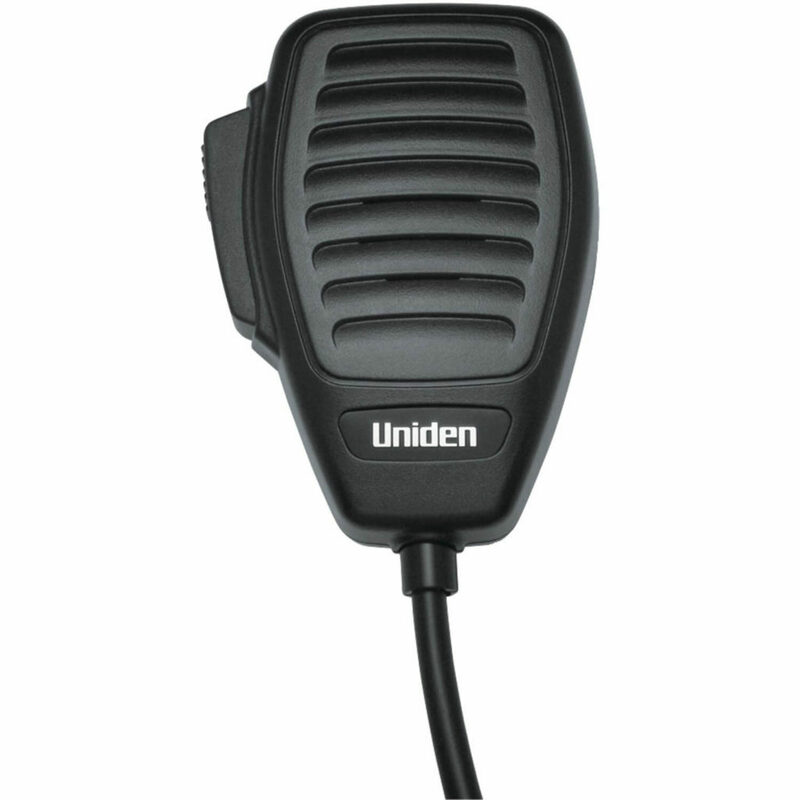 If you own a Uniden PRO500 series CB radio and are looking to replace its stock mic, the BC645 is worth considering. It features a minimalistic design which any CB operator will appreciate. The design includes a large push to talk side button that’s easy to press while transmitting. 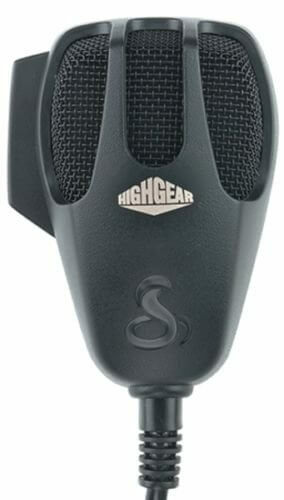 The microphones shell is made from high-quality ABS plastic which is both durable and breaks resistant. The shell doesn’t include metal parts, so you don’t need to worry about rust. The Uniden BC645 is also a power mic which requires a single battery to operate. Compared to plug and play mics, the BC645 offers better sound output as the voice signal is amplified before being transmitted. Other features you’ll find on the BC645 include an 8 foot flexible cord with a 4 pin connector. The rugged futuristic design is the first thing you’ll notice about the Ranger SRA 198 CB mic. A lot of attention has been placed in creating a cool looking easy to handle mouthpiece. It is great as best noise cancelling CB mic. Like the other mics I’ve included in this CB radio mic review, it includes a side placed push to talk button, a long coiled cable, and 4 pin connector. The 4 pin connector allows you to use this microphone with almost any CB radio model on the market today. It’s a plug and play type of mic meaning you won’t need to invest in batteries to operate. The Ranger SRA-198 also comes fitted with noise cancellation. This will filter out background noise allowing anyone you’re communicating with to hear you clearly. An often overlooked consideration, the mic design plays a huge role on how easy it is to handle. An ergonomic, lightweight design is easier to handle and therefore promoting safety while you’re on the road. Look at the push to talk button. If you handle the mic with your left hand, the button should be placed on the right side of the mic and vise versa. Most CB microphones on the market include a 7 to 9 foot cable. I prefer a longer, coiled cable because it allows me to use the mic even when standing several feet away from the radio. 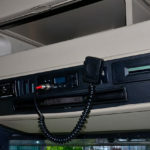 Many new CB radios will connect to a mic via a 4 pin connector. Therefore, always go for mics using this connector type. Many new CB radio microphone models include the noise canceling and power capability feature. Although these might add to the cost of the unit, I have found mics with these features to provide better sound clarity and which is the best CB power mic. Above all are the best power microphones for CB radio. 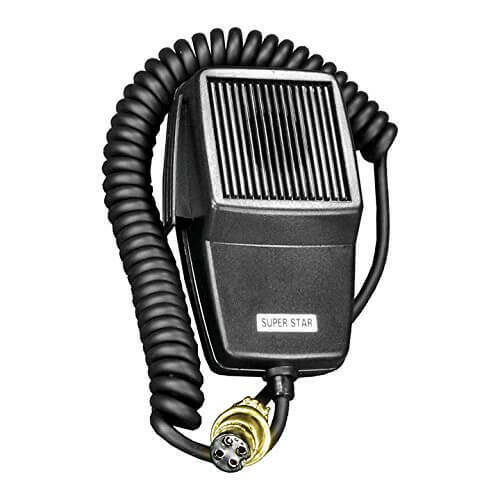 There are many reasons why you might want to replace your CB radio microphone. Regardless of your reasons, you will need to find a unit that’s compatible with your CB. Also, the mic should capture and transmit voice waves clearly. Now, head to the market and get a good CB microphone and enjoy using it. Maybe that’s a great investment which is going to make you love the CB communication more! For additional information on Mic Wiring, please visit our CB Microphone Wiring page! you can get Astatic 636 CB mic by clicking on the link above. Or you can try other best CB Microphones there. Hello. You can find hundreds of them on Ebay. They also come in different colors. I need a mic for a Midland cb model 75-785. I see Midland makes a headset for it. I would like to find a mic that I can clip onto my shirt or caller of my shirt or coat. I want to use it when I ride motorcycle. Thank you. Sure. Get it from the link attached.